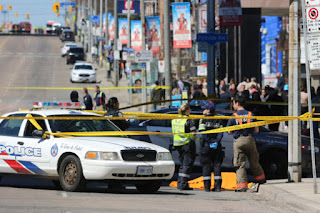 One of the busiest arteries in Toronto (2.6 million inhabitants) was the scene of horror on Monday afternoon. A van went up on the sidewalk and ran over multiple people. Ten have died and 15 have been injured, according to the police, who received the notice at 13:37 local time. The incident was deliberate, according to the agents, but the Canadian government said at night that it is not related to matters of national security. The driver, who fled, has been arrested. This is Alex Minassian, 25, who was not signed by the security forces. Ralph Goodale, Minister of Public Security of Canada, warned at a press conference, shortly after it happened, that it would be "inappropriate to enter into conjecture" regarding the causes of the incident. He also stated that there are no indications to raise the level of risks in the country. "We're just getting to know the situation in Toronto. Our hearts are with all those affected. We will have more to know and say in the next few hours, "said Canadian Prime Minister Justin Trudeau on the CTV network. The tragedy occurred on the corner formed by Yonge Street and Finch Avenue, a very busy area of the city, the most populated in Canada. The van traveled a whole mile sowing chaos, panic and, above all, death in its path. Several witnesses have assured the newspaper The Globe and Mail that it had been an intentional act. At the time of the arrest, which was picked up in a video recording, the suspect shouted "Shoot me in the head!” According to The New York Times. "I have a gun in my pocket," he warned, too, to end up surrendering with his hands up. One of the witnesses, who called himself Ali, explained that the van had climbed onto the sidewalk rolled everything in its path: pedestrians, mailboxes or electric poles. About eight ambulances went to Sunnybrook Hospital. The head of the medical services of the center, John Flengas, described what happened as "pure slaughter". "We ask people to avoid the neighborhood for a few hours to facilitate the work of the police. It is important that people do not go down Young Street, "said Toronto Mayor John Tory. The incident coincides with the celebration in Toronto of the summit of foreign ministers of the G7 (Germany, Canada, USA, France, the United Kingdom, Italy and Japan) which is dealing, among other issues, with the fight against terrorism and against jihadist extremism. The vehicle is a rental van from the Ryder Company. Toronto's Sunnybrook hospital reported early on that it had received seven patients from the area in which the accident occurred, according to Reuters, although it did not say if it was injured or deceased. Meanwhile, the images published by some users of social networks began to show covered bodies that predicted the worst. The police confirmed a few hours after there were nine fatalities, although the figure could increase due to the seriousness of some injuries. The metro service has been interrupted between the Sheppard-Yonge and Finch stations. The public bus lines are also not circulating in the area of the incident. The news has caused concern in Canada in the wake of attacks on pedestrian vehicles in European cities in recent months. In the country there are also precedents: on September 30, a man rammed four people in Edmonton. Hours earlier he had run over a policeman. Also, on October 20, 2014, a young man hit two soldiers in his car in Saint-Jean-sur-Richelieu (Quebec). The possibility that the outrage is deliberate, as some witnesses quoted by the local press claim, triggers the alarm about terrorism. Jihadist extremism has used the rolling of people on public roads as a weapon of terror in recent years. It happened in the attacks in Nice and Berlin in 2016 and in Barcelona last August, among other tragedies. As the hours wore on, however, the Canandian security forces were still unable to provide a full account of what had happened, so that no relationship can be established with extremism. At night, the Canadian government said the incident was not connected to national security, which seems to clear the possibility of an attack. Quebec (Canada) suffered an attack on a mosque on January 29, 2017. Alexandre Bissonette, then 27 years old, came in with a gun and killed six people, in addition to injuring six others. Last February he pleaded guilty and was automatically sentenced to life imprisonment, without the trial being held.